The Vickers machine gun (also known as the Vickers gun) was a machine gun that was used by the British Army from 1912 to 1968. It was made by Vickers Limited. The gun was very reliable. It was one of the most commonly used weapons in the first world war. The cockpit of a Bristol Scout biplane in 1916, showing a Vickers machine gun synchronised to fire through the propeller by an early Vickers-Challenger interrupter gear. British Vickers gun team in action at the Battle of the Somme. Both are wearing gas masks. Rear view of Vickers gun team in action at the Battle of the Somme. Vickers gun set up for anti-aircraft purposes during the First World War. Vickers machine-gun of the 1st Manchester Regiment in Malaya, 1941. British Vickers gunners in action in the Netherlands during Operation Market Garden. All are wearing the Mk III Turtle helmet. British commandos on the outskirts of Wesel during Operation Plunder in 1945. View of the breech of a Vickers gun showing brass feed ramp. Dorsal view of a Vickers gun showing fluted water-cooling tank. 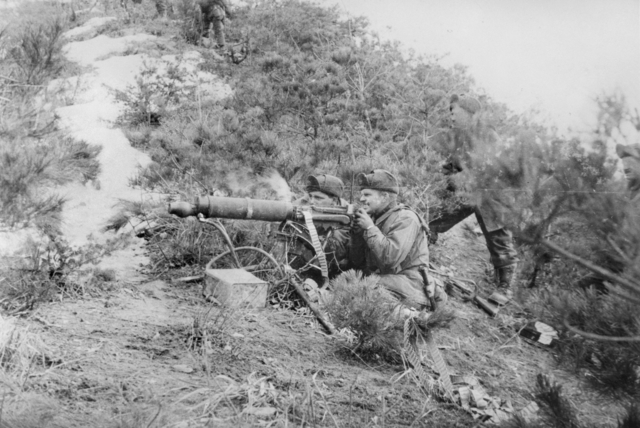 An Australian soldier manning a Vickers gun during the Korean War. Vickers machine gun from Polish Army Museum's collection. Vickers machine gun Facts for Kids. Kiddle Encyclopedia.